The person behind the humanitarian approach known as ‘Embrace the World’, is Amritanandamayi Devi. The suffering of people has affected her in such a way that she took it up as a responsibility to ease them from this pain and provide them with solace. From her very childhood she practiced meditation and even composed spiritual songs. Though it is thought that to understand spirituality one should attain a certain age, yet the songs which Amma composed at that age were remarkably grave. She was often heard humming those and one could tell that she was in a trance while singing. She was nine years old when he mother was seriously ill. Therefore, to take care of her siblings and the household, she had to withdraw from studies. They domesticated cows and to feed them Amma went from door to door to get food. During this time, she saw the society closely and witnessed the sufferings people go through. Immediately she thought of helping people in distress and did all that was at her disposal. She provided people with food and clothes which she took from her house and for doing this she was rebuked, but nothing could stop her from carrying on this noble work. Today, she is known as Amma across the globe and people find peace by getting her ‘darshan’. She has also inspired her followers to work towards helping the needy, and in this way she is helping humans bind in a selfless bond. 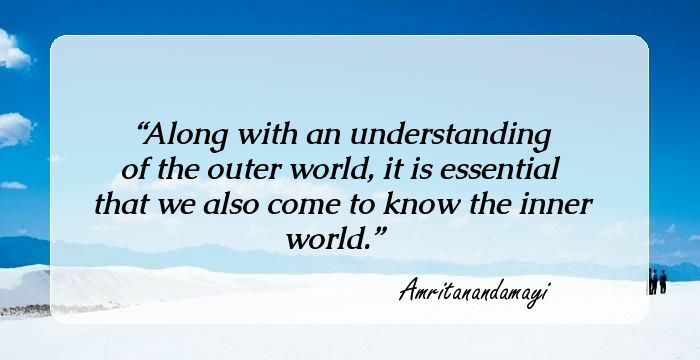 Along with an understanding of the outer world, it is essential that we also come to know the inner world. 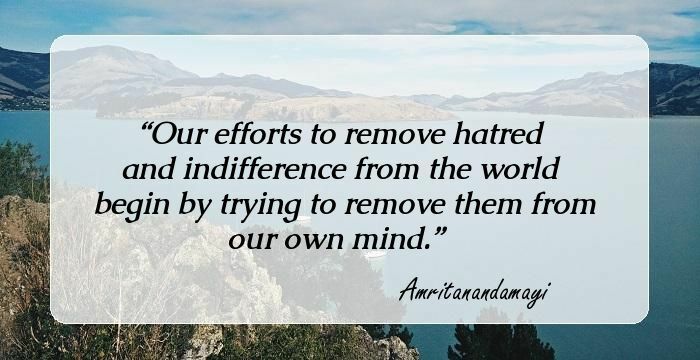 Our efforts to remove hatred and indifference from the world begin by trying to remove them from our own mind. 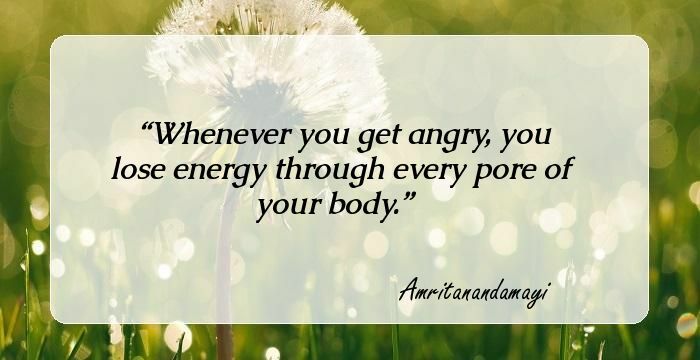 Whenever you get angry, you lose energy through every pore of your body. Only God loves us selflessly. Pray for a peaceful and contented mind in all circumstances. The main purpose of education should be to impart a culture of the heart. Don't be discouraged by your incapacity to dispel darkness from the world. Light your little candle and step forward. God is deep within us. He dwells there as pure and innocent love. Surrender and living in the present are one and the same..
Get rid of the ego to know the reality. Innocent prayer, is a very powerful way to please the Lord. You don't need to be a scholar to do that. Have the conviction that God is your only real relative and friend. Keep a constant awareness and a conscious effort to say good words, perform good actions, and to practice patience and compassion. In order to attain this grace, cry and pray, hold on to the feet of the Guru, no matter what happens. Only when human beings are able to perceive and acknowledge the Self in each other can there be real peace. Amidst sorrows, the only thing that enlivens us is optimistic faith. Never lose that faith. Love makes you innocent like a child. A child is the most receptive person. A child's expressions have a beauty of its own. Purely natural and spontaneous they are free of ego. If we continuously maintain self awareness, we will be able to experience peace and happiness. Real success is gaining the ability to face situations in life with maturity. Isn't it because there is darkness that we know the greatness of light? If you want a certificate of approval from others, you won't receive a certificate from God. Look upon others as being part of yourself. Every male being first lies in a woman's womb, as a part of the woman's very being. Engage in work that will benefit others. A life of renunciation is the greatest form of satsang - others can see and emulate it. Pray to God in times of both joy and sorrow, then you will no longer suffer. Children, each and every object in life around us teaches us sacrifice. The greatest strength of women lies in their innate motherhood, their creative, life-giving power. If we focus on the eternal, we will remain unaffected by the changing experiences of life. The light of Guru's grace helps us to see and remove the obstacles in our path. The mind which is attached to a thousand different things, pulls you in all directions. The past is like a cancelled cheque; it's futile to brood over it. Spiritual knowledge is a burden if carried on the head, but beautiful if brought into the heart. There is nothing in this world that hasn't nourished our growth in one way or another. Night is the best time to pray. Nature is quiet. No one will disturb you. God cannot sit silent and unmoved when somebody calls Him with an innocent heart. You must work in the present to make your future happy and blissful. Be like the honeybee who gathers only nectar wherever it goes. Seek the goodness that is found in everyone. Mahatmas teach us through their own lives. Our attitude should be: Whatever happens I will remain strong, courageous and happy. Those that have an attitude of service towards others are the beauty of society. Our duty towards God is compassion and love towards the poor and needy. All your problems arise because you don't stand firm within your Self. God's power is not something outside. It is within us. We need to awaken that power. Does the sun need the light of a candle? God needs nothing from us. We are not afraid of death. We are afraid of the loss we will incur when we die. It is the same Consciousness that pervades everything. A real yogi is one who can maintain a peaceful mind in the midst of any crisis. Leading life without discrimination is like shooting without taking aim. The beauty of our ears is not in our earrings, but in listening to the distressed. Be a symbol of undying optimism. Lead lives imbibing spirituality, only then will it become meaningful, full of joy and beauty. God is the one who gave; He alone has the right to take back. Do not imagine that sitting with eyes closed alone is meditation. Finding fault in others, just for the sake of finding fault, we will pollute our own minds. Know the nature of this world, do not lose your equanimity. No external power can possibly obstruct woman or her innate qualities of love, empathy, and patience.